Best Interests is becoming a hot topic topic that is increasingly impacting the world of business. As Corporate Superannuation Consultants, we are increasingly seeing employers taking a greater interest in their Corporate Super Default plans and ensuring that they are doing the right thing by their employees (especially when data is presented which shows the TRUE position). The full impact of the Royal Commission reviews into Superannuation and what the findings mean for employers has yet to unfold. We believe that it is only a matter of time before the governance of Superannuation Default Funds is tested with an action by employees (like the 401k actions in the USA – it’s a different system but the principles remain the same). Take a look at this news article from CNBC (Lousy 401(k) plans may spark more lawsuits, Article by Ilana Polyak, 1 May 2016). You can also look at what happened with Australia Post after the Royal Commission. The CEO received a letter on behalf of employees asking questions about the selection of the default super fund. This led to Australia Post undertaking a strategic review of default superannuation arrangements for all employees. What is Acting in best interests? There is no doubt that there is a lot of talk about the employee, their super and what is and what is not right. But what about the conversation about How To act in the best interests of a workforce in dealing with their super. Before we talk more about that, let’s explore an Employers governance duties. Super is a cost to a business and therefore is under the stewardship of the directors and officers of the company under the Corporations Act 2001. The Corporations Act handbook gives guidance on the content of the Act and how it applies to Directors and Officers. If an organisation is incorporated under the Corporations Act 2001, there are Sub-Sections within the Handbook that provide a broad overview of the more significant responsibilities and duties of Company Directors, other Officers and employees under that legislation. It is also important to note that a company’s internal management is required to be governed by provisions of the Corporations Act 2001 that apply to the company as replaceable rules, by a Constitution or by a combination of each one. In relation to responsibilities of Company Directors, other Officers and employees, and the internal management of the company, Board Members need to familiarise themselves with relevant requirements established under other laws including Common Law. A Company Director or other Officer must exercise their powers and discharge their duties with the degree of care and diligence that a reasonable person would exercise, in the same company circumstances, if they occupied the office held by, and had the same responsibilities within the organisation as, the Company Director or Officer. Rationally believe that the judgment is in the best interests of the organisation. A Company Director or other Officer of a company must exercise their powers and discharge their duties in good faith in the best interests of the corporation and for a proper purpose. The reliance is made in good faith and after making an independent assessment of the information or advice, having regard to the Company Director’s knowledge of the corporation and the complexity of the structure and operations of the corporation. CLICK HERE TO DOWNLOAD A SAMPLE OF OUR SUPER PLAN EVALUATOR REPORT. 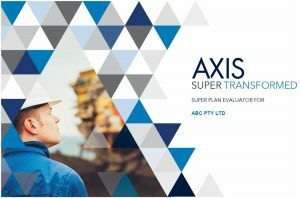 READ AXIS SUPER DIRECTIONS – Engaging employees in employer initiatives such as superannuation is a constant battle for HR departments. AXIS has recognised this, and so is re-inventing the way employees are reached. READ AXIS FUND FACTS – The Royal Commission uncovered some poor practices and here we share our findings on the super fees and insurances that employees are facing. READ AXIS IMPACT – Richard Matsinger attended the 2018 WSSA Conference in September as a guest panellist where he shared his views on technology and how it can and is being used to improve adviser practices.